Jane Jacobs (1916-2006) is history's most celebrated urban critic. In addition to her classic, Death and Life of Great American Cities, Jacobs authored another half dozen influential books on urban planning, economics, and design. She was also a tireless advocate of vibrant city neighborhoods. 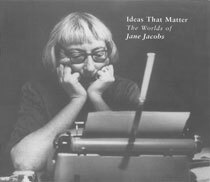 Ideas that Matter: The Worlds of Jane Jacobs offers students, enthusiasts, and critics unprecedented insights into the work of this seminal thinker. Originally published in 1997, and continually sought after ever since, this 2011 edition includes a new introduction by distinguished urban scholar Mary Rowe. The book is a unique combination of Jacobs' own writing (including previously unpublished speeches, letters, and articles), biography, and analysis by other scholars. Arranged by topic, it sheds light both on the development of Jacobs' theories and her life. A chapter on Death and Life of American Cities reveals a debate between the author and her publisher about changing the book's title. A section on Europe includes letters home from Frankfurt, Paris, London, Venice, and other cities that shaped her sensibilities. And a chapter titled "Ideas" offers analysis from ten contributors who examine Jacobs' thoughts on issues from population growth to urban infill, self-employment to the wealth of nations. What results is a captivating scrapbook, offering a distinctive understanding of Jacobs' most important ideas. "...it is as though someone has emptied an entire filing cabinet and sorted the contents into thematic chapters."